and Soldier Tradesman, House keeper vacancies. Candidates will be selected through Physical Tests, Medical and CCE Exam for this Open Recruitment Rally at Gaya. At Gaya Rally only physical tests and document verification will conducted. 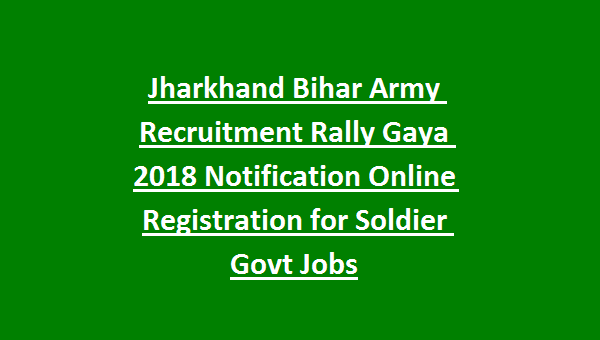 For this Gaya Army recruitment Open rally candidates belongs to the Bihar State are eligible. Online applications registration will start from 26-11-2018 to 31-12-2018. Gaya Recruitment open rally will be held from 01-Feb-2019 to 14-Feb-2019. Those who are applied online they are only eligible for attending the Army recruitment rally at Gaya as per given schedule. Scheduled will be released separately on news papers. Register online via the official website of www.joinindianarmy.nic.in to attend this Army recruitment rally of Gaya. More details of Gaya Recruitment rally open bharti of Bihar state is given below. Admit Card available from 03-01-2019 to 05-01-2019 ONLY BLACK & WHITE LASER PRINT ADMIT CARD ACCEPTED. 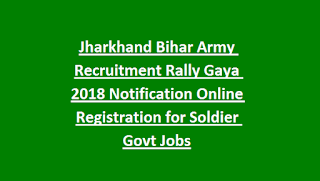 There are various vacancies available under Bihar state quota for this Gaya Recruitment Rally. For Soldier General Duty-10th pass with 45%. For Soldier Technical Ammunition Examiner-10+2 with Maths, Physics, Chemistry and English with 50% of marks or 3 years polytechnic diploma or ITI certiifcate. Candidates will be selected through physical standards/Efficiency tests, medical examination and CCE written test. Chest for all 77+5 cms and weight is 50 kgs. Race of 1.6 kms Running to be completed within 5 min 45 sec. For Soldier GD & Tradesman posts written test will be conducted for 100 marks. For all other posts written test will be held for 200 marks. Candidates will are interested to be part in Indian Army they can apply online for this recruitment rally of Gaya on or before 31-12-2018. Attend the recruitment rally as per given dates. Time to reach the ground is 04:30 to 07:30 AM. After 07:30 AM no one is allowed to enter in the ground. Submit the form online @www.joinindianarmy.nic.in.